Italian architect and designer, Antonio Citterio is known as the gentleman of design. He has a gentle and elegant vision of the object, an adjective that expresses his nature as a man and a designer. Antonio Citterio was born in Meda, Italy in 1950. He opened his own design studio in 1972 and graduated in architecture at the Polytechnic of Milan in 1975. Between 1987 and 1996 he was associated with Terry Dwan; together they build buildings in Europe and Japan. In 2000 he founded, with Patricia Viel, an international design company that develops complex planning programs, at every scale and in synergy with a qualified network of specialist consultancies. The study has today taken the name of “Antonio Citterio Patricia Viel“. The firm develops projects of residential and commercial complexes, industrial plants, conservative restructuring of public buildings, planning of work spaces, offices, showrooms, hotels. He is active in the field of corporate communication and realizes projects of coordinated image, displays and graphics. In the field of industrial design, Citterio currently collaborates with Italian and foreign companies such as Ansorg, Arclinea, Axor-Hansgrohe, B & B Italia, Flexform, Flos, Hermès, Iittala, Kartell, Maxalto, Sanitec (Geberit Group), Technogym and Vitra. In 1987 and 1994, Antonio Citterio was awarded the Compasso d’Oro-ADI. Since 2006, he is professor of architectural design at the Academy of Architecture in Mendrisio (Switzerland). In 2007, he received the prestigious “Royal Designer for Industry” award from the “Royal Society for the Promotion of Arts, Manufactures & Commerce” in London. Also in 2007, Antonio Criterio and Partners obtains the UNI EN ISO 9001: 2000 certification. In 2008, he received the “Royal Designer for Industry” award from the Royal Society for the Promotion of Arts, Manufactures & Commerce in London. Numerous participations in international competitions: at the Binnenalster lake, at the Milan Fair; the “Brooktorhafen” bridge in Hamburg; in Amsterdam; at the Deutsche School of Milan; and in September 2004 at the International Architecture Exhibition of the Venice Biennale, “City of Water” section. Some of his works are part of the permanent exhibition of the MoMA in NYC and the Georges Pompidou Center in Paris. 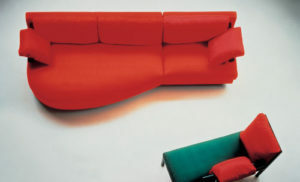 The Sity sofa, designed by Antonio Citterio for the B & B Italia furniture company, was a model of moderation, class and elegance compared to the design of the Eighties and in a certain sense set the parameters of what is still considered a design of contemporary furniture of great taste. B&B illustrates the importance of this sofa in its corporate monograph, and defines the importance of this sofa as “a courageous step forward towards the search for a seating system composed of flexible and separable structures, able to reorganize today’s complex life scenario“. This modular system was based on some central elements, including a straight sofa, a curved version and one with a chaise longue and another twenty pieces, including a bed, which could be added on request to the basic core or be arranged in the same room. In fact, the chaise longue, so curvilinear and almost circular to form an end of the modular sofa arrangement, is still copied by many sofa manufacturers and designers of all latitudes. The unifying and uniform elements of the modular system include the black plastic feet and the tubular armrests. The Sity sofa was much appreciated at the time and for this reason its modular system Citterio in 1987 received the Compasso d’Oro. Often, however, precisely because of the era in which it was created, the importance of this sofa tends to be underestimated. 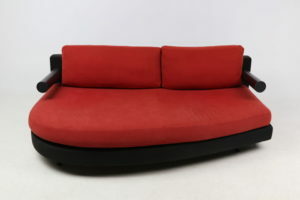 Critics and historians are generally more attracted to the strong colors, shapes and incisive expressiveness of the Memphis movement, yet the Sity sofa is definitely one of the designs of the years Eighty to have had absolutely more influence. The experimentation and the research are at the origin of the project of Mart armchairs and small armchairs, which are born from a new production technology of the thermoformed leather. The B&B Italia Research & Development Center is looking at the shoe sector for this project, always careful to identify materials and technologies that best respond to the peculiarities of individual projects. And this is how the thermoformed leather becomes a distinctive feature of Mart. Two types of seating: a smaller and wider one. Three bases are provided: rotating (disc or cross) and with a structure that, thanks to a simple manual movement, allows the body to have a more or less inclined double posture. 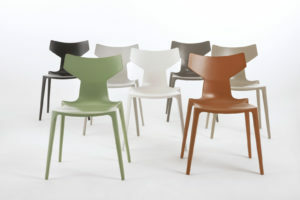 Produced with a strong personality, Mart has a silhouette from which the relaxation function can be understood. Only a few symbols to creatively solve the press campaign to support the launch. 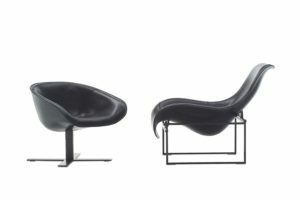 The 2000 project by Antonio Citterio, Iuta has over time become a true icon for B & B Italia. A series of seats and armchairs dedicated to the contract market, it is characterized by a technical mesh in metal mesh finished with a polished anodised profile. With or without armrests, it ensures extraordinary comfort. 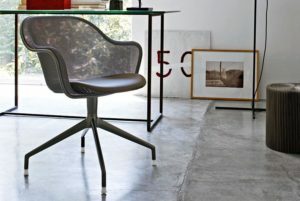 The Iuta seat is also available with a wide choice of bases that make it ideal as an executive office chair. Among the various models the one in chromed tubular or with four spokes with fixed height or with five spokes with adjustable height. The chairs have a padded seat while the armchairs also have the backrest with padding as an option to offer a more comfortable support. Dolly chair – The result of an in-depth technical project, the Dolly folding chair combines the elegance and formal lightness of the overall design with a sophisticated and solid structural system. Available in different colors, including bright colors with seat in the same plastic material of the structure that makes it suitable for different contexts. The seat in plastic material allows, for resistance and ease of cleaning, a use in every environment, from the home to the office, thus extending the product offer to the contract market. 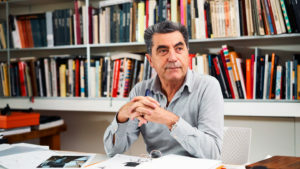 His studio, Antonio Citterio Patricia Viel and Partners, founded with Patricia Viel in 1999, is characterized by ease in making vertiginous steps, moving from large urban surfaces to small details, and operates internationally by designing masterplan, hotels, residential and commercial complexes, as well as dealing with industrial design. It is no wonder that the study boasts in Italy the primacy in the use of BIM, Building information modeling, an innovative project method, now widespread internationally, which allows you to control the entire design process, especially on an urban scale. Thanks to its ability not to follow trends, but only its instinct and its strong ideas on what a project should be, realizes a timeless and discreet design, objects and architectures without time tied to a great concreteness, with minimal evolution on the typology, which is not however formalism. Bio Chair by Antonio Citterio – Here comes the final version of Bio Chair, a seat designed by Antonio Citterio and born from the research on BIODURA™, an innovative material obtained from renewable raw materials not involved in the production of foodstuffs. 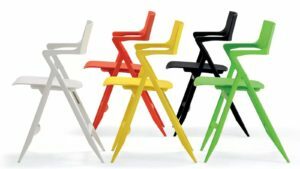 Kartell first experimented with this type of material in furnishing, specifically in injection and molding: the result is an elegant, resistant and perfect seat both for outdoor and indoor use, ideally at the end of its useful life. under appropriate conditions it can be included in biological cycles or be biodegraded. Sometimes he looks at the great masters, from whom he tries to perceive and assimilate specific aspects of the work, certain assonances that are more of spirit than of fact. As for example in the Charles sofa, a tribute to the design of the Fifties and Sixties, evidently to Charles Eames, characterized by an essential design of the feet in die-cast aluminum. His tributes, Charles, the Ray chairs, the Eileen table are a nice way to declare the references, the similarities, the contaminations. With a careful look at the past and the future, he learned a lesson from modernity. 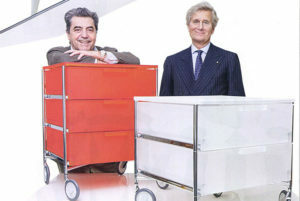 Particularly fond of the world of hôtellerie and of the contract, Citterio has signed projects for prestigious brands such as Bulgari, Aspesi, Valentino and important chains, defining a new concept of hotel or luxury store, which respects the demands of contemporaneity and points on the quality of the service, materials and experience of space use.